Book a room at Hotel Sofia Litomysl for your travel to the Pardubice Region. This friendly Czech Republic accommodation is located in the heart of the eastern Bohemian town of Litomysl, a cultural centre best known for its monumental Renaissance castle. Rated a 3 star guest house, Antik Hotel Sofia Litomysl consists of 4 rooms and 5 apartments distributed over 3 storeys. Guests can enjoy dishes drawn from Czech and Bulgarian cuisine in the restaurant or, in summertime, in the outdoor seating area in the garden. 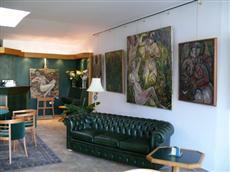 The public areas of the guest house are decorated with original artwork by local Czech artists, especially Sarka Hrouzkova. A fax machine and tourist information are available at the reception desk, where you can also find drinks, gifts, and toiletries for purchase. Antik Hotel Sofia Litomysl is within walking distance of the historic centre of Litomysl, graced by one of the largest town squares in the country, a Gothic town hall, and many lovely Renaissance and baroque houses. The Litomysl Castle (Zamek Litomysl in Czech), dating back to the years 1568-1581, is a remarkable example of refined Renaissance architecture, with exquisite interiors. Other attractions include the Litomysl Regional Museum (Regionalni muzeum v Litomysli), the Monastery Garden (klasterni zahrady), the Bedrich Smetana Museum (Smetanuv Dum), and the permanent exhibition of the works of Czech contemporary sculptor and designer Olbram Zoubek in the Litomysl Castle Vault Gallery. The guest house is approx. a 1 hour drive from the city of Pardubice and a 2 hour, 30 minute drive from Prague.